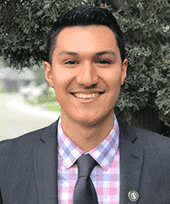 Noel is proud to be a Sacramentan and has been active in local non-profit work and youth advocacy since he was a teen. His prior exposure to volunteerism, led him to the Sacramento Youth Alliance, where he leads projects that include a Sacramento Youth Bill of Rights. He has also immersed into internships and work experience related to social equity and public service. This wide range of field experience has enabled him to see through differing perspectives, and to find innovative solutions to issues facing local youth. He remains extremely passionate about improving access to higher education for youth in marginalized communities.